Great news came from the Smithsonian’s Conservation Biology Institute in Front Royal VA – 4 maned wolf pups were born on January 5! Maned wolves are an endangered species found in the grasslands of South America. This omnivorous species is threatened mostly by habitat loss, a common problem for endangered species (see endangered species post). I have a special interest in this fascinating species, because I was lucky enough to learn about them as a volunteer at the Conservation Biology Institute. After studying the wolves, so that I could give tours and explain details to guests, I was allowed to enter the enclosure with one of the hand-raised wolves. What a terrific experience! I had never been so close to a wild wolf (even though she was hand-raised) – she definitely commanded my attention! The 4 new pups add to the total of 72 pups born at the National Zoo. Congratulations to the entire staff who are working on conservation of this beautiful species! So there I was, wandering through a local craft fair, enjoying the free samples of onion dip and cookies, as well as the creativity of the artists displaying their wares. Not exactly a mecca of eco-friendly thought or products, but this green momster does enjoy a good craft show. As I turned down a new aisle, one jewelry display caught my eye – the jewelry was made from various leaves, seeds, even insect exoskeletons, covered in copper. The artists then add color to the copper to make these pieces really beautiful works of art. 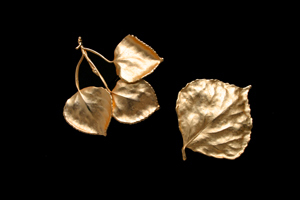 But here’s the really cool thing – it’s jewelry with no eco-angst! As I talked with one of the artists, Mary Anna Barratt, I found out that the copper for the jewelry is from recycled sources. Add to that the fact that the company donates part of their proceeds to Global ReLeaf at an organization called American Forests, and you’ve got a pretty eco-friendly company. Nature’s Creations Natural Jewelry is a great example of two ways that we can make an eco-friendly impact on our environment. First as consumers, where we spend our money matters. We can choose to support eco-friendly businesses and send a message that we’d like more of the same. Second, as the artists from Nature’s Creations have done, we can search our everyday lives and practices and look for ways to go a little greener (check out low hanging fruit for simple ideas). And full-disclosure – I did NOT receive any compensation or free jewelry for this post. 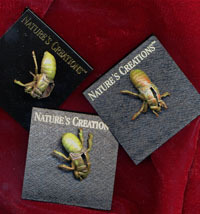 But I am totally diggin’ my new copper cicada exoskeleton pin – so cool! So you slept through science class, part 2 – molecules, energy, and zebra dung! In the last post about the basics of science, we talked about DNA. I mentioned that DNA is a molecule, and I outlined its structure and the mutations that can occur in this molecule. Let’s back up a little this week – what exactly is a molecule (for those who always wanted to know, but were afraid to ask)? Science talks about something called “matter.” “Matter” is anything that has mass and occupies space. Thus, just about everything you can see and feel is made of “matter.” If we continue to drill down, we find out that matter is made of building blocks called atoms. Just think of atoms as the Legos in this picture, and the castle (matter) is made of atoms. Science textbooks describe atoms as the smallest particle of an element that still retains all of the properties of that element. But what is an “element”? We’ll get back to that in a minute. When we look at atoms, we see many particles that make up atoms. These particles are called “sub-atomic particles,” and we usually refer to three distinct “sub-atomic particles” -- protons, neutrons, and electrons. Protons and neutrons hang out sort of in the center of the atom (the nucleus), while the electrons fly around the nucleus. The particles are extremely small, with electrons being the smallest. To give some perspective to the relative size of these sub-atomic particles, (this is really cool…) think of the atom as being the size of FedEx Field or any other large stadium. The nucleus, with its protons and neutrons would be roughly the size of a fly sitting on the 50 yard line. The electrons would be about the size of a few gnats flying around the rest of the stadium! So now we know that protons, neutrons, and electrons make atoms which combine to make matter. But what about elements and molecules? Each individual atom has a set number of protons in its nucleus (the center of the atoms). An element is a substance consisting of atoms that all have the same number of protons in their nuclei. So for the castle above, if it were made from one element, all the Legos would be the same. Oxygen is an element – every oxygen atom has 8 protons in its nucleus. If the atom had 7 or 9 protons, it wouldn’t be an oxygen atom; it would be the atom of a different element (the element nitrogen for 7 protons in each atom; the element fluorine for 9 protons in each atom). Carbon is an element – every carbon atom has 6 protons in its nucleus. A molecule is simply the smallest particle of a substance -- any substance like water, DNA, or salt (compare that to an atom, which, as we said, is the smallest particle of an element). At this point (the molecular level) , we’re mixing atoms of various elements to make new substances. We’re no longer just dealing with elements, where every atom is the same. Now we’re mixing various types of atoms to make things like water, DNA, or salt. Molecules can be combinations of different atoms, or several of the same atom. So, for organization of matter, we’ve got sub-atomic particles (protons, neutrons, electrons) –>atoms –> molecules. At this point, my students are raising their hands and asking, “will this be on the test?” I need to answer the all-important question – Who gives a flying flit about molecules and matter? What does this have to do with environmental awareness? New reports often talk about chemical contamination in our food and water. 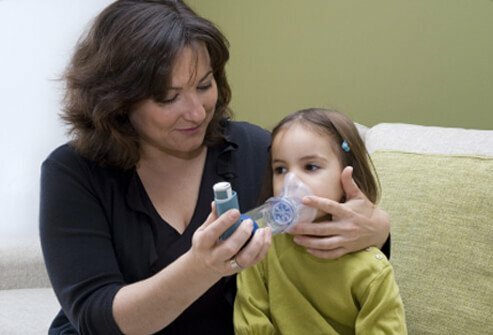 We read about air pollution or second-hand smoke that affects our lungs. We hear about possible new renewable energy sources. All of these topics are talking about molecules – scientists are working at a molecular level to answer questions and solve problems. Here’s a great example – I was just reading an article by Guy Gugliotta in the New York Times about a possible new energy source – cellulose, a large molecule found in plant cells. 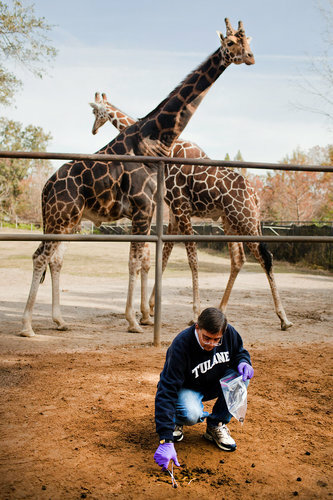 Researchers are looking for a microbe in the dung of various zoo vegetarians (giraffe, zebra, etc.) that provide a simple way of turning cellulose into a renewable energy source. Research at a molecular level could provide a new, renewable energy source! So there you have it -- molecules in a nutshell. And, yes, nutshells are made of molecules. As promised, the perfect side for last week's chili -- Phil's Cornbread! Make more than you think you'll need -- this is a crowd-pleaser! Just this past week, the Endangered Species Coalition published a report on the 10 U.S. species most threatened by fossil fuel production and use. Included in the list are well-known species such as polar bears and whooping cranes, little known species such as tan riffleshell and Kentucky arrow darter, and some of my favorites like the Kemp’s Ridley sea turtle, dunes sagebrush lizard, and Wyoming pocket gopher. Assuming that we care about these species and their roles in the ecosystem (see post "A few misconceptions about endangered species" 12/31/11), what’s a person to do? I’m not able to make national decisions about our country’s energy sources (although in a Desocracy we’d concentrate heavily on renewables and conservation). But remembering that our country makes up approximately 5% of the world’s population, but uses over 20% of the world’s oil, we each have an important role to play in protecting the listed endangered species. I adapted this recipe from a Cooking Light chili. Don’t be afraid to fiddle with the spices to make it taste the way you like it. I made a batch for 70 people this week at our church and everyone loved it! Next week, I’ll post the accompanying cornbread recipe. The birthday of Martin Luther King Jr. has become a popular day for volunteering – what a great tribute to a great American! For our family’s volunteer stint, we headed out to our favorite park, Sky Meadows State Park. We left Cujo and the other dogs at home (see my New Year’s post), and headed out with a team of folks to do trail maintenance. This was the kind of volunteer job I love – no heavy lifting or back-breaking work. All we had to do was hike our assigned trail and note in a GPS unit where we found problems on the trail, ie. fallen trees, deep holes, clogged water bars. Nice work if you can get it! It was chilly, but once we got out of the wind and into the woods, the sun kept us nice and warm. Our trail maintenance team consisted of adults and kids, and we had a great time hiking the Gap Run trail. I won’t say that all of my volunteer gigs for the environment are this easy and enjoyable, but they’re usually very rewarding. The last time our family volunteered for the environment, we had the satisfaction of maintaining a beautiful park picnic area and keeping it free of weeds! We also got the added experience of poison ivy a day or two later – mental note, bring gloves next time. I’ve done quite a bit of volunteering at the National Zoo, both at the Invertebrate House and at the Conservation Biology Institute. The advantage of volunteering in a place like the zoo is how much you learn as a volunteer. I can go on and on and on (so say my friends and relatives) about the fascinating animals I encountered – octopus, maned wolf, spiny lobster, Przewalski’ horse. And even when folks looked at me in the invertebrate house and asked, “Where are the REAL animals?” I often got at least one or two of the people in their group to see that golden orb weaver spiders are pretty cool. I know that most of us spend a lot of time volunteering for our local schools, churches, soup kitchens, or libraries, but it’s worth considering spending a few hours volunteering for the environment. Due to budget cuts, our parks, nature centers, and zoos rely heavily on volunteer hours. I know of one park where volunteer hours are double the number of paid hours each year! How can you volunteer for the environment? Well, there are the obvious parks and nature centers, but there are also lesser known activities. How about stream monitoring with a local watershed protection group? Only have one day per year to volunteer? Consider participating in a Christmas Bird count or a 4th of July Butterfly Count. There’s something for everyone – even scuba divers in the Chesapeake Bay can lend their skills helping with water clarity and other efforts. You may not be able to do much, but every little bit helps – be a hummingbird! Any other ideas on volunteering for the environment? This recipe (adapted from the Whole Foods recipes) comes from my friend Sandy, a busy French teacher and mother of two. She always very generously brings a batch over to my house. Thanks Sandy! The kids love them with some applesauce for dipping. 1) Mix potatoes into the onions. The onion juice prevents potatoes from turning black. 2) Using your fingers, pick up small amounts of potato mixture by the handful and squeeze out as much liquid as possible. Reserve all liquid and allow it to settle in a bowl for a few minutes. Put pressed potato and onion mixture in a clean bowl. Carefully pour off watery part of the reserved liquid but do not discard the thick starchy sediment at the bottom of the bowl. Scrape that into potato mixture. 3) In a small bowl mix eggs, salt and pepper and combine with potato mixture. Add matzah meal to batter, starting with 3 tablespoons and adding more if necessary until potato mixture has enough body to stick together. 4) Heat a 1/2-inch depth of oil in a heavy skillet, preferably cast iron. Form potato mixture into pancakes of approximately 3 inches in diameter and drop into oil. Fry, turning once, until golden on both sides for a total of about 6 minutes. Drain on clean brown paper bags. Chef notes: Potato latkes can be frozen. After completely cooking pancakes, place on a cookie sheet and freeze, then store in a container. When ready to use, reheat in a 400°F oven for about 10 minutes. Serves 6.
if the movie includes talking animals, I’ll probably love it. Vanishing of the Bees: Excellent overview of colony collapse disorder and the importance of honey bees in today’s agricultural and natural environment. We keep bees at our house and even the kids enjoyed this documentary – they were so moved by it, that they wrote a letter to President Obama (beekeeper in chief) about the issue. Dirt! The Movie: Interesting topic, although the consensus at my house was the point could have been delivered in half the time. The movie raises many interesting issues about various agricultural methods and new initiatives underway. Filmmakers ignore the elephant in the room – the issue of human population. I loved hearing the interview with Nobel Prize winner Wangari Maathi (what a loss when she died this past year) – her hummingbird story will be repeated in our house frequently! Movie ends with a positive message. Dolphin Tale: Sugary sweet tale about efforts to save a dolphin with a damaged tail. Morgan Freeman is always fun to watch and the setting in which the two child characters are growing up definitely looks like fun. Rio: 90 minutes – check! Talking animals – check! I loved this movie about two endangered parrots and the effort to save them. Parade scene is very funny. David Attenborough’s Life Series: One of the best nature documentary series I’ve seen. Fascinating natural history information delivered in a calm, British accent (and admit it fellow Americans, they just sound smarter than we do with that accent). The photography is unbelievable – you’ll spend as much time wondering how they got the shot as you will marveling over the beauty and complexity of nature. Happy Feet: Loved the talking, dancing penguins! Unfortunately, the message at the end of the movie was a little heavy-handed for a kids’ movie. Still worth a rental. Frontline’s Poisoned Waters: It’s loooong (2 hours), but well worth your time. A comprehensive overview of the issues in two major U.S. waterbodies, the Chesapeake Bay and Puget Sound. The conclusion emphasizes the need for public involvement, education, and action. A few classics to consider on movie night: Never Cry Wolf, Born Free, Erin Brokovich, and Babe (OK, not environmental, but it’s meat-free AND it has talking animals!). If you’re popping your popcorn for movie night and really need help deciding which environmental film to watch, check out Grinning Planet. 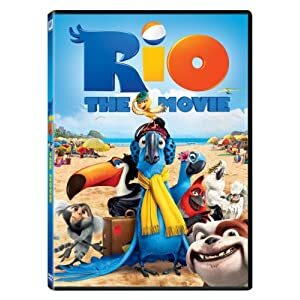 Anybody else have suggestions for environmental movie night? Eagerly awaiting The Lorax and GreenFire – I’ll keep you posted! Endangered species and dogs. As Maria sang in the Sound of Music, these are a few of my favorite things! I just heard a fascinating report on NPR on the ways in which dogs are helping with orca research in Puget Sound. It turns out, as with many animals, the feces of orcas are helpful in telling scientists about the animals' health and environment. I remember when volunteering at the National Zoo's Smithsonian Conservation Biology Institute, scientists often used animal urine, such as Eld's deer urine, and sometimes feces, to provide valuable information on animal health issues such as fertility cycles. My family and I headed out for our annual New Year Day hike at Sky Meadows State Park today. I always really look forward to starting the year hiking with the family through our favorite park. We’ve hiked on unseasonably warm New Year days. We’ve hiked in ankle deep snow. We’ve hiked with nutty families who inspired our oldest son to request a “no non-family hikers on New Year” rule. It’s always fun starting the year with the family. This year, we headed out a little later than usual. When we got to the park, we were stunned to find the park so full that we needed to use the overflow parking. Usually, we’ve got the park to ourselves for our mid-winter hike, so it was quite a surprise to see all our fellow hikers. In what turned out to be not one of our best decisions, we brought two of our dogs along for the hike. One of our dogs, is what they call “dog aggressive.” To protect his identity, we’ll just call him “Cujo.” Hiking with Cujo is actually very pleasant, unless, of course, he meets another dog. Since everyone on the trail brought at least one dog on the New Year hike, our peaceful annual hike quickly turned into a “before” scene from the Dog Whisperer. Our fellow hikers gave us the stink eye as we yelled apologies for Cujo’s behavior. People with golden retrievers shouted “training tips” at us. In our defense, Cujo has been to doggie obedience classes (he passed, thank you very much) and we do work with him regularly. He’s just what they call in sports “un-coachable.” In my opinion, if the toughest dog you’ve trained is a golden retriever, you should probably keep the “tips” to yourself. Moving along the trail, enjoying a few quiet moments, we encountered someone whom my son recognized – the cafeteria lady from his school! We chatted for a bit, and then kiddingly I said, “Well, I hope my kids are behaving in the cafeteria!” In a fit of honesty that her husband found embarrassing, she pointed to my son saying, “He’s good in the cafeteria,” and then pointing to my daughter, “Her……sometimes.” What a proud parenting moment I had, standing in the woods with the cafeteria lady, my family, and Cujo. Off we went, wishing them “Happy New Year!” and wondering how to avoid any other hikers or dogs over the next 2 miles. Fortunately, we managed to avoid too many more hikers, and we moved into the area of the park that provides unbelievably beautiful vistas of the Virginia landscape. I always feel like the weight of the world has been lifted off my shoulders, as I stand at the top of the hill, gazing down at the Piedmont region, saying to my husband, “that’s where we’re going to live when I win the lottery!” Ah, the peaceful New Year hike had returned! Then the wind started to blow, the skies opened up, and we enjoyed a brisk hike back to the parking lot, cold rain pelting our faces. It’s still my favorite way to ring in the New Year! Even a so-so day hiking with my family is better than most other days anywhere else!